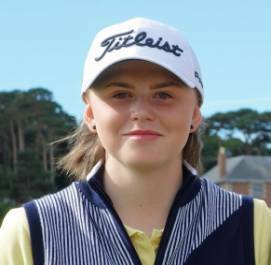 Hazlehead's Jasmine Mackintosh toppled the defending champion Connie Jaffrey (Troon Ladies), winner of the Scottish women's amateur championship at Royal Aberdeen 12 months ago, in today's (THU) second round of the 104th tournament at Golf House Club, Elie in Fife. Mackintosh, pictured, not in the top 10 of the 32 match-play qualifiers from the 36-hole stroke-play eliminator, scrambled through her first match-play tie, winning at the 24th against Molly Richmond (Strathaven). Far from sapping her energies, Jasmine came out like a lion refreshed for her afternoon second-round tie and was four up after 11 holes against Jaffrey before achieving a famous victory by 4 and 3. Hannah McCook (Grantown on Spey), winner of the Welsh and Irish stroke play titles in consecutive weekends recently, KO'd Sheena Wood (Aberdeen Ladies) by 4 and 3 but had to go to the 19th in the second round to take the measure of Lorna McClymont (Milngavie). Top seed Chloe Goadby (St Regulus) reached the last eight fairly comfortably although she had to win the 18th to chalk up a two-hole victory over Louise Duncan (West Kilbride) in the second round. C Goadby (St Regulus) bt M Gardiner (Linlithgow) 4 and 2. L Duncan (West Kilbride) bt C Young (North Berwick) 3 and 2. K Marshall (Baberton) bt K Beveridge (Aboyne) 1 hole. G MacDonald (Craigielaw) bt C Griffiths (Aboyne) 3 and 2. H Darling (Broomieknowe) bt M Cowan (Wigtownshire) 4 and 3. J Saxton (Muckhart) bt C Boa (Royal Dornoch) 1 hole. H McCook (Grantown on Spey) bt Sheila Wood (Aberdeen Ladies) 4 and 3. L McClymont (Milngavie) bt Susan Wood (Drumpellier) 2 and 1. K Wright (Stranraer) bt G Paton (St Regulus) 1 hole. G Batty (West Linton) bt L Allan (Glenbervie) 3 and 1. T Mactaggart (Minto) bt K McIntosh (Broomieknowe) 5 and 4. H MacGarvie (Troon Ladies) bt E Hynd (Elmwood) 2 and 1. J Free (Gullane) bt J Rankin (Haggs Castle) 3 and 1. A Summers (Carnoustie Ladies) bt E Hale (Troon Ladies) 7 and 6. J Mackintosh (Hazlehead) bt M M Richmond (Strathaven) at 24th. C Jaffrey (Troon Ladies) bt M Fraser (Powfoot) 5 and 4. Goadby bt Duncan 2 holes. MacDonald bt Marshall 3 and 2. Saxton bt Darling 2 and 1. Summers bt Free 1 hole. Mackintosh bt Jaffrey 4 and 2. C Taylor (Nairn) bt E Kennedy (Paisley) 2 and 1. E Docherty (Moray) bt L Morrow (St Regulus) 2 and 1. L Fraser (Kingsknowe) bt G Kyle (East Renfrewshire) 1 hole. L Wilson (Kelso) bt S Stichbury (Gullane) 6 and 5. K A Scott (Strathaven) bt M Robb (Peterculter) 4 and 3. C Thompson (Royal Dornoch) bt E Bissett (Elie and Earlsferry) 5 and 4. A McBride (Harburn) bt D Young (North Berwick) 1 hole. Taylor bt Docherty 4 and 3. Fraser bt Wilson 4 and 3. Scott bt Thompson 1 hole.